I have to admit, I'm already in the Christmas mood, and to top it off - it's snowing this morning in Boston. We have a lot in store for you this holiday season! 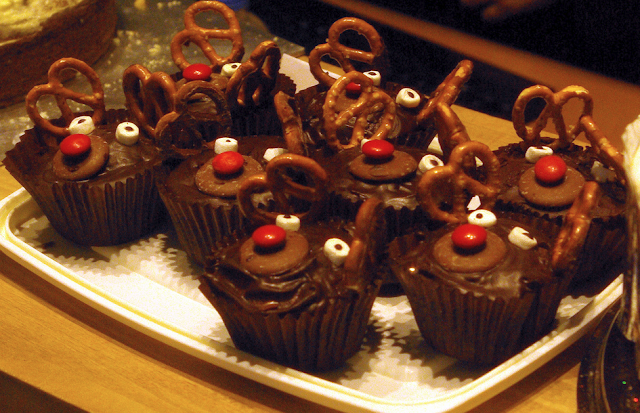 Here are one of my favorite easy cupcake treats for December...Reindeer Cupcakes. 1. Bake cupcakes of your choosing. I took the easy way out on these and made chocolate cupcakes from a box mix. 2. Frost with chocolate frosting. 3. Top with pretzels for the antlers, a piece of round melting chocolate for the nose, M+M for the red tip of the nose, mini marshmallow for the eyes (with a dot of black icing for pupils). Note: you can also use a Nilla wafer for the nose! Please post your pictures to our facebook wall once you make them! Love them...so cute! My daughter loves to bake for Christmas, going to give her this recipe. are you putting the M&M s on with frosting or what? Oh gosh, these are darling. I am going to make them with my grandkids! I'm making these today for a family Christmas Eve party. They need to be nut free, and M&Ms aren't safe for the nut allergic kids. Have any ideas for a white M&M substitute on the eyes? Renee, simply use white frosting or confectioners sugar mixed with a tiny bit of water. That should do the trick! your day deserves a great Breakfast!